Convenient smartphone application therefore no additional or dedicated lone worker devices are required such as lanyards. 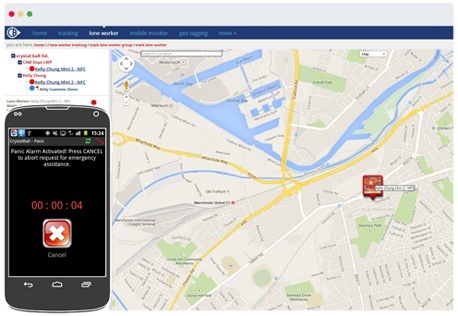 Using GPS, MobileLWP provides full visibility of lone workers on live mapping, together with detailed reporting. MobileLWP is accredited with British Standard 8484; ‘Code of Practice for the provision of lone worker device services’. An automated timer activated by the lone worker to notify administrators of regular monitoring intervals. If a RWC expires without the lone worker responding, a panic alarm is automatically activated notifying company administrators. 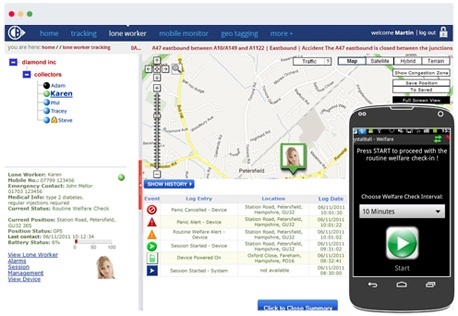 Panic alarms automatically trigger email/text alerts to designated recipients, detailing the lone worker’s current location. Using MobileNFC, lone workers can check in/out of designated locations notifying administrators of their arrival/departure and time at location. If a panic alarm is activated a preassigned number will be automatically dialled allowing an administrator to listen to the situation. Why Do I Need Lone Worker Protection? Our industry renowned lone worker solution safeguards the welfare of your lone workers, and offers assistance for Health & Safety legislation. Most lone work solutions only allow lone workers to raise an alarm when something happens. Our pro-active solution triggers an alert when a lone worker fails to check in.